What can be cooked in a Dutch oven? Why are they called a dutch oven? Are all Dutch ovens oven safe…Can Dutch ovens go in the oven? How to use a dutch oven in a conventional oven? Where else can you use a dutch oven? Who makes the best Dutch oven? Can Dutch ovens go in the oven…You would like to think that the clue is in the title…Dutch oven…but not everything is as straightforward as that. In principle, the short answer to the question is yes. The Dutch ovens can be used on all heat surfaces…induction, electric solid plate, ceramic glass, radiant ring…and also ovens fired by gas, wood or coal. The longer answer involves a series of questions which you must answer yes, in order to safely use your Dutch oven in the oven. Can Dutch ovens go in the oven? The simple way to determine it is to follow the manufacturers recommendations. If you know the make and model, this will be the most accurate answer. Visit their website or call their customer care line. Assuming that you cannot do this, we need to determine it ourselves. The vast majority of Dutch ovens are made from cast iron but you do increasingly see more stoneware options. They are both designed for oven use. You should however check the condition of the item. Do NOT use the item if there is a crack in it, especially if there is an enamel coating on the inside. It may sound a little odd to mention this now but Dutch ovens come in a plethora of sizes. Some of which are huge. Its worth checking if it fits your oven before you start your preparation. If it does not fit, its worth checking out this article on roasting. Depending on the temperature you are planning on cooking at, it is worth noting the material the handle is made from. 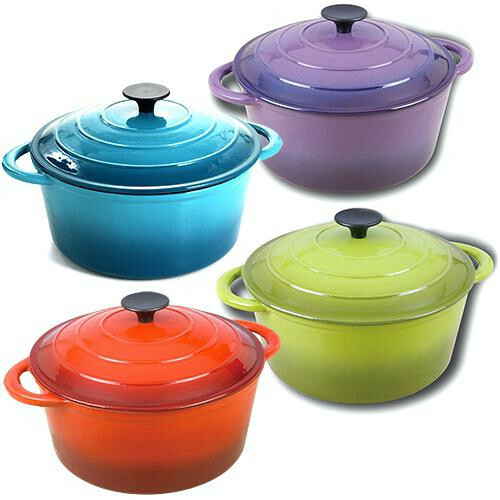 If we take the example of the Le Creuset range of Dutch ovens, they offer different handles depending on the range. On the classic range, the maximum temperature is 375°F / 190°C. On their Signature offering, the handles are black phenolic knobs. These items are heat resistant to 480°F / 250°C. The Dutch ovens without a temperature restriction are ones with metal handles. For obvious reasons, ones with wooden handles are an obvious no. The black phenolic knobs on the signature ranges are heat resistant to 480°F / 250°C. On the classic range, the maximum temperature falls to 375°F / 190°C. Ones with wooden handles must never be used in an oven, however, metal handles can be used at any temperature. It is recommended that any pans are placed on a shelf or upon a rack. They are heavy cooking pots with tight fitting lids. They are produced with varying quality…premium to budget. However, they are famous for producing great cooking results. They retain heat fantastically well and the heat is also distributed evenly with fewer hot spots. The are so versatile, from stove top to the oven. They function so well when it comes to meat dishes, often being used to braise meat on the stove top and the whole unit transferred to the oven. They have an ability to operate at very high temperatures and can also be used for deep frying. Where do i find the best Dutch ovens at the lowest prices? They got their name because they were invented in the 1700’s by the Pennsylvania Dutch. Often, they are referred to as a French oven or even a Cocotte. Cast iron is naturally non-stick and thus is not coated with a synthetic material. Of course, you need to season it appropriately to get the best out of your Dutch oven. They can operate at very high temperatures safely. This also applies to enameled versions. Any pans coated with a synthetic non-stick material can become toxic at high temperatures. This is where there is concern. Yes, of course you can use a conventional oven to cook using a Dutch oven. In fact, you can cook in all kinds of ovens from gas to electric ovens, convection ovens and conventional. The Dutch oven is so versatile that even these methods pale into comparison when you hear of people burying them in campfire coals, in roasters, barbecues…and obviously, the stove top. There are many manufacturers who cover a number of price points and budgets. In terms of premium brands, there is no reason to look further than Le Creuset or Staub. Le Creuset for example have perfected the art of enameling on to cast iron. Their standards are impeccably high, rejecting over 30% of all production because of imperfections. Prices are relatively high, but this is subjective as their ovens, if cared for correctly can last generations. If you’d like to learn more about Le Creuset, click here for our definitive guide on Le Creuset. For a more budget friendly version, the American producer Lodge is always a safe option. The price point is much lower the Le Creuset but obviously the quality is lower too. However, for infrequent users, they are more than capable. I hope this article answers you question… Can Dutch ovens go in the oven? Yes!